Under the direction of Gay Okolowicz, guidance counselor at that time, and Mrs. Mary Agnew, principal, an application for a charter in the National Junior Honor Society was made. This request was approved and the St. Charles Borromeo Catholic School in Orlando Chapter of the National Junior Honor Society became effective during the 2002-2003 school year. The Principal, after reviewing the NJHS handbook, names a faculty member to serve as the NJHS Chapter Adviser, and appoints a five-member Faculty Council. Neither the Principal or Vice-Principal may serve as an Advisor or on the Faculty Council. The Chapter Advisor is the sixth, non-voting member of the Council. All final decisions rest with the school Principal. Under the direction of the Principal and the NJHS Advisor, the Faculty Council develops a membership selection procedure, consistent with the Constitution of the NJHS. Once reviewed and accepted by the Principal, the selection process must become public information. In addition, Chapter by-laws must be written to clarify the operating procedures of the chapter. Maintain a permanent record at the school of all students who are officially inducted into the school chapter (name, grade and date of induction). Maintain affiliation with the national office on an annual basis, and pay the annual school fee. Only students who have completed one full semester at SCBCS are eligible for membership. Students who have been inducted to the NJHS at a prior school will be permitted to enter the SCBCS chapter after verification of induction. This includes a copy of the membership card or a letter from the prior school’s NJHS sponsor. Maintains a cumulative 3.5 out of 4.0 GPA. Obtains and completes any late work/ work missed during an absence. Demonstrates initiative in promoting school activities. Exercises positive influence on peers in upholding school ideals, sportsmanship, or community service. Demonstrated dependability in any responsibility accepted. Volunteers and provides dependable and well organized assistance, is gladly available, and willing to sacrifice to offer assistance. Renders any requested service to the school cheerfully and enthusiastically. Volunteer services for the poor, elderly, or disadvantaged, e.g. Brother’s Keeper store, Extended Care facilities for the elderly and infirm, Morning Star, etc. Shows courtesy and respect in assisting visitors, faculty and fellow students. Understands the importance of civic involvement, as evidenced by an awareness of issues of social justice, the need for strong leadership skills, and a respect for the government of the country, state, community and school. Demonstrates leadership skills through mature participation in activities such as scouting, community organizations, school clubs, and sports teams. Consistently exemplify desirable qualities of behavior such as cheerfulness, friendliness, poise, and stability. Cooperate with school policies including care of property (such as books, lockers, furniture, and environment); and uniform requirements. Demonstrate the highest standards of honesty and integrity by acknowledging adherence to rules, avoiding even the appearance of cheating, and an unwillingness to profit from the mistakes of others. Regularly show courtesy, respect, and concern for adults, peers, and any other members of the community. Maintain a 90% or higher conduct grade for the same three quarters prior to selection. Students who meet the academic GPA requirement will be identified. Conduct history of those identified as candidates will be reviewed. A letter will be drafted explaining the requirements, the date of the deadline for the submission of forms, and the selection process. Students meeting the initial criteria will be given the letter and student activity information form. This is to be completed by the student and signed by both the student and his or her parent/guardian. Students will return the completed forms by the specified due date. Late forms will not be considered. Student Activity Forms will be screened by the Advisor for completion of requirements. The forms of those student candidates, who meet the requirement, will be forwarded to the Faculty Council for review. Faculty Council will receive copies of the Student Activity Forms, as well as a copy of the student’s behavioral history. Council members may request additional information from the Advisor. Candidate review forms must be returned to the Advisor by the specified date. No late forms will be considered. The Advisor will review the Faculty Council’s recommendation and generate a list of students to be inducted into the NJHS. Principal will be notified of inductees. Parent/Guardian of inductees will be notified via e-mail and USPS. Parent/Guardian of those students not selected will be notified via e-mail and USPS. Induction Ceremony will by planned and executed by the Faculty Advisor. Date for the Induction will be approved by the administration. NJHS members and parents will provide a post-induction celebration for the new inductees and their families, to be coordinated through the Advisor. Formats, plans, and celebrations will be evaluated by Advisor and administration after each induction. Advisor and advisory council is responsible to periodically review member’s academic and conduct record. Students will be notified at the beginning of the year that reviews will take place at progress reports and end of quarters. The Advisor may review the records of any member as needed. Advisor will notify administration of any member in danger of probation or dismissal. Member and parent will be notified of probation and consequences of continued concern. Academic Probation required when GPA drops below 3.25. Members who receive detentions for any behavioral incident will be placed on probation. Probation will extend to the end of the current trimester. Advisor, advisory council, and administration may extend probation until the following trimester as needed. Behavioral incidents occurring within the final quarter of the year may prevent the student from being allowed to receive recognition at the end of the school year. Should the behavior not improve, the student may be dismissed from NJHS. Academic improvement will be reviewed at the end of the trimester following academic probation. Students whose GPA is below 3.25 at the end of the probationary trimester will be dismissed from NJHS and will not be eligible for reinstatement. Student and parent will be notified of dismissal. Any behavioral incident occurring while member is on probation is grounds for immediate dismissal. Conduct issues of a severe nature may result in immediate dismissal from NJHS. Incident will be reviewed by Advisor, advisory council, and administration. A conference between parent, student, Advisor, and administration will be set. The decision for dismissal will be determined by the administration and will be final. The Advisor, advisory council, and administration will review all students who have been on probation during the school year. This review will determine the student’s ability to receive NJHS recognition at the end of the school year. The Advisor must be notified, in writing, of the member’s desire to resign from NJHS. Said letter must be co-signed by the member’s parent/guardian. Any member who chooses to resign must relinquish any certificate, pin, or other NJHS paraphernalia. Membership resignation is permanent and final. The students of the National Junior Honor Society have begun a program of giving and service for the students of St. Charles School on Wednesdays at Mass. Students at all grade levels will be asked to make weekly donations according to their grade levels. Canned goods and monetary donations will be accepted from all students. Each item donated counts as a single step in our journey to walk a mile during the school year. We need your help! Please donate weekly to help the Brothers Keeper Ministry! 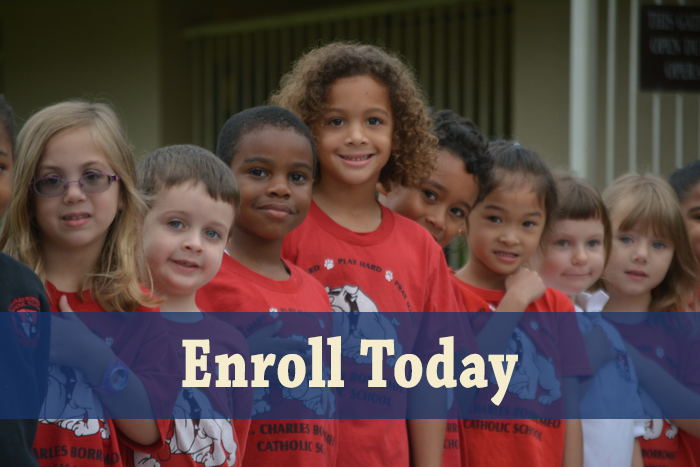 Thanks for helping make stewardship a part of life at St. Charles School, a Catholic School in Orlando!